Learn about the concepts of Living World and Battle Beyond to discover the many world-building details making up Star Wars Battlefront II. But we wanted to remedy that – so, we’ve listed 15 such minutiae implemented throughout the levels of Star Wars Battlefront II below! But first – to offer some context – a quick overview of two visual design concepts that we’re applying to the game. Missioned to invigorate the locations of Star Wars™ Battlefront™ II, our artists work with the ideas of the Living World and the Battle Beyond. In short, the idea of Living World underlies our aim to add believability, ambience, and intimacy to our battlefronts. Using the upcoming location Geonosis as an example, its Living World includes swarms of Geonosians, the world’s native inhabitants, flying erratically above players’ heads. The Battle Beyond, similarly, supports the location’s sense of scale. Using Geonosis as an example again, you’ll see starfighters swooping in over the barren battlefield, Spider Droids shooting lasers, and other visual effects in the backdrop adding to that grand Battle of Geonosis sensation. And, sometimes, you’ll see limited interactions with the Living World and Battle Beyond. Driving a speeder on Mos Eisley and accidentally (or not . . .) finding yourself on a collision course with a huge ronto wandering the streets will have the beast instinctively lifting its front legs, trying to avoid impact. However, most importantly, Star Wars is a rich and deep universe, and consequently, it’s simply expected from fans and players that details cultivating the unique Star Wars atmosphere are in place. Therefore, Living World and Battle Beyond are, interactive or not, a vital part of making the levels feel like you’re actually in the world of Star Wars. We’re looking forward to players experiencing all facets and niceties of Geonosis in November. But now, let’s dive into a list of 15 (or so) things to discover in the game today. An unfortunate side effect of the light and dark side ironing out their differences in larger municipalities like Theed and Mos Eisley is that their everyday life gets abruptly put on hold. You’ll see civilians getting out the way quicker than quick as the battle begins in these locations. In Star Wars Battlefront II, not all military personnel you see will aim down the sights and engage in combat. You’ll also see Imperials conducting interrogations in the streets of Mos Eisley, or Rebels held as captives in the Starkiller Base prison quarters. Speaking of prisons. Some of Jabba the Hutt’s Gamorrean guards are found behind bars in the lower levels of Jabba’s Palace. Probably not the turn of events the porcine warriors expected, but hey, at least they’re not rancor fodder! Yet. Prison cells and rancor pit aside, Jabba’s abode houses a few other unpleasantries as well. The droid torture chamber is one of them, supervised by the cruel EV-9D9 unit. Though being temporarily disabled, her work is still on display here, with a protocol droid twitching uncontrollably in a dark corner of the room. Poor thing. Moving on to Kamino, aiwhas travel both the ocean and air with equal grace. In Star Wars Battlefront II, these majestic cetaceans are seen flying above the stormy waters around the Cloning Facility. The tall and black-eyed Kaminoans are not letting the surrounding battle on Kamino interrupt their research and science. You’ll find quite a few of them still working at their stations in the Cloning Facility. These combat vessels are used by the Separatists to penetrate structures and deploy troops through the gap. A number of them can be seen climbing and assaulting the Cloning Facility as part of this location’s Battle Beyond. All part of the native fauna, the tall-necked ronto, furry bantha, reptilian dewback, and tough-but-grumpy eopie are often domesticated by the inhabitants of Tatooine and commonly seen on the streets of Star Wars Battlefront II’s Mos Eisley. Jawas are small-sized scavengers native to Tatooine, characterized by their hooded attire and bright-yellow eyes. They can be witnessed fleeing the Mos Eisley junkyard as the battle commences between Imperials and Rebels. Similar in height to Jawas – around one meter tall – Ewoks are, however, not short on bravery. The inhabitants of the Endor forests can be seen on the walkways and huts built among its treetops. You can even play as an Ewok yourself and fend off stormtroopers in the Ewok Hunt game mode! The tach is a harmless primate living on Kashyyyk, recognized by its bright, reddish skin and white-furred head. It can be seen roaming the grounds on the Wookiee home planet. Another ape-like mammal is the woolamander on Yavin 4. Usually going about its life in the canopy of the forest, the woolamander is seen around the ancient ruin grounds and forest floor in Star Wars Battlefront II, donning a coat of blue, red, and yellow fur. Also sharing its living space, is the runyip. This creature is on the heavier side, recognized by its striped coat and antlers. 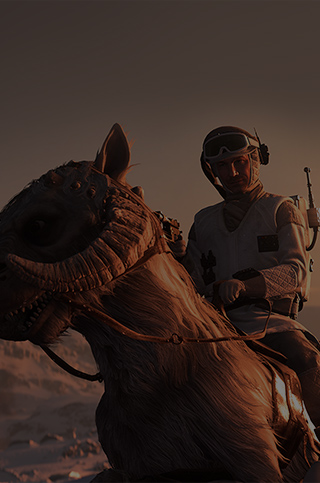 The nightwatcher worm can be found on Jakku, sticking its head up from beneath the sand to survey the area. Recognized by its red, glowing eyes, a first impression of the creature might be deceiving. Lurking beneath the surface is actually a 20-meter-long predator with a jaw capable of turning metal objects into scraps. There’s a wide variety of birds inhabiting the locations of Star Wars Battlefront II. We have pelikki sitting calmly on the Solleu river of Theed, sneeps running about the crashed Star Destroyer on Jakku, and geejaws flying around the forests of Endor. Whether it be the IT-O Interrogator droid patrolling the corridors of Death Star II or an astromech unit peeping down an alleyway in Mos Eisley, Star Wars Battlefront II is filled to the brim with droids of different sorts. Can you name them all? Now, have you discovered everything covered on the list? Or have you found something else in the game that’s not on there? Make sure to share your discoveries with us on the official forums or on social (follow EA Star Wars on Twitter, Facebook, and Instagram).